Hi, I am curious how long it took before you felt really comfortable going on a shoot and exuberantly pleased with the final result of the Matterport Space. I've shot 12 so far and still get a little nervous. When I compare the MPS's I can see definite improvement but am wondering when this uneasiness will pass. Ha! I'm always uneasy with mine after I finish, and I've been doing them for a long time and feel confident I know what I'm doing. But there are so many factors we can't control, and I'm always worried about how the lighting is going to look. I'm always a little nervous from the time after the scan is complete until the email arrives from Matterport saying it is done. I've only ever been so disappointed in a result that I've rescanned a location a couple times, but there are some that I'm a little embarrassed of. @craigsauer thank you for being so candid. Reading your post makes me feel that I'm not in this alone. Thanks! Hi Lisa, from what I've learnt, if your camera cannot or does not see a specific area, then the floor plan would be a bit messed up. Sometimes it makes sense to capture a scan spot even if you feel that there would be no use of it or that no one would want to navigate to that spot. Below is a link to a villa I shot. 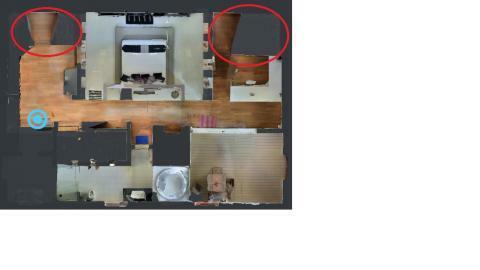 If you see the floor plan view of "Floor 3", you'd notice two "V" shaped cones in the plan (below is the screenshot of the cone areas circled. I did not bother to shoot them since they were storage spaces. Also, this house had an elevator which is the square box in the floor plan on all floors. Hope this helps.....! Below is the link to the model. I am like Craig. Even though I am comfortable doing the scans I am always a little uneasy until I open the showcase...oops I mean Space. It is just a process that evolves. As you get better you add more things. For instance now I always do outdoor areas during the scan. It is time consuming but the results are worth it. I do tend to over scan to get as much data as possible i.e. if I have used 79 scans I will fill in with 20 more. I am paying for the 99 scans for the model, I might as well use them. You will always be learning because each project presents new challenges. Interesting...I never even thought to be nervous. Remember this...if you screw it up you have an EXCELLENT opportunity to make a client for life!